Are you looking for a way to better take care of your brain? As we age, many of us stop learning and get into habits. While it may be easy, this keeps our brain from being active and constantly thinking, which can lead to depression, a loss of energy, focus, and potentially dementia. With more baby boomers retiring, it is becoming even more important that we look into ways to keep ourselves and our parents active and thinking. 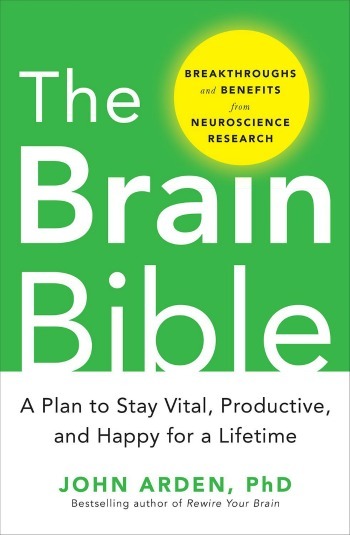 In Dr. John Arden’s latest book – The Brain Bible -he goes into how we can stay healthier and happier by protecting our greatest asset – our brains. With more baby boomers retiring, it isn’t too surprising they want to stay as healthy as possible. While great medicine and diet can help, it is also important that you keep your mind sharp and constantly learning. In The Brain Bible, Dr. John Arden teaches others how to care for their brain using the latest neuroscience discoveries. By following the techniques in the book, you can age while still having sharp mind, energy, focus, and of course, happiness! Personally, I thought this was a very interesting read. While it may not be as entertaining as some other self help books, it is filled with lots of science, research, and facts to keep your mind sharp. The author also makes some of the topics personal, having surveys scattered throughout the book and different activities to teach you how to keep your mind sharp and constantly active. Even though the book is written for baby boomers, it does have a lot of useful knowledge for everyone. Just know that some parts of it are very dry and its one of those books that is better is read in pieces. Based on my own experience with this book, I am happy to give it a B+ rating. Would you love to read this book yourself and see how you can better care for your own brain? You can find The Brain Bible on Amazon.com for $18.50 or $11.99 on the Kindle. This sounds like something that we could all use. Thank you for your review. I like the idea of this book as a reference guide for helping our brains as we age to work to the maximum of their abilities. I think its a must read for anyone whom is aging and their caregivers. It is important to keep your mind active. Especially as you get older. I feel like my memory is slipping. This would be a good read for me! Sounds nteresting. As they say if you dont use iit you lose it. I also find video games as being helpful! Sound like a great reference guide for a healthy brain. And as a baby boomer, this would be the perfect read for me. Thanks!